The Moore Wilson’s card is at the heart of what we do. Available to consumers as well as trade customers, and rewarding regular shoppers. Qualify as a Gold Customer by spending $2000 over a 12 month period - an average of less than $40 per week. Moore Wilson's has long supported farmers and we are a proud Farmlands Card Partner. 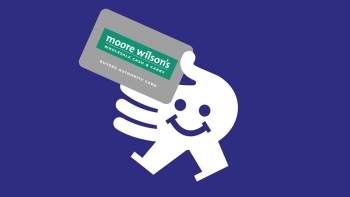 If you have a Farmlands Card, you are welcome to present it in lieu of a Moore Wilson's card at the checkout. As a Farmlands Cardholder, you automatically qualify for Gold Card Rewards. Applying on behalf of a business? Please email us to request a business application form. For a personal card, please complete the form below. If you would like us to send out a replacement card or update your address, please contact us or ask in store.